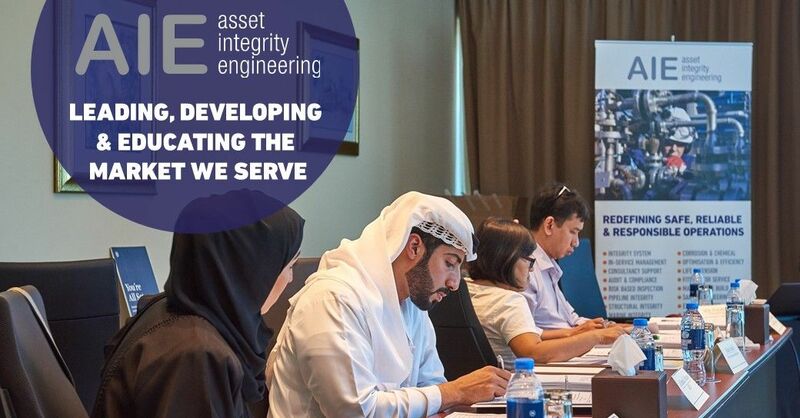 AIE | Why choose AIE for your Asset Integrity and Corrosion Management Training? What makes a good training experience? Will we meet your expectations? Will you come away with knowledge, tools and techniques that are relevant for when you go back to your workplace? Whether you are involved in the Oil and Gas industry, Nuclear industry, Power Generation industry or any hazardous industry, your Plants and Processes alone will not enable you to realize your goals of safe and efficient production. Achieving operational excellence requires the knowledge, expertise and competency of the people who are managing, maintaining and operating those plants and processes. That is to say, the competency level of a production engineer is as important as the equipment they are operating and the competency of an inspector testing an emergency shutdown valve is as important as the valve itself. Therefore, it is essential for all levels of an organization right from management to the front-line operations, maintenance and integrity teams to have the relevant competency level obtained through training and on-the-job experience in order to successfully accomplish their day-to-day tasks and to meet their organization’s long-term goals and objectives. As with all good training, the foundations and theory that make up the respective topic are thoroughly explained. Fundamental to ensuring that the attendees achieve their maximum learning potential, we reinforce and support our theory using real-life examples and case studies that are reviewed and analyzed in a discussion-based atmosphere. In addition, we incorporate the lessons from industry all over the world. Our goal is to ensure that your organization does not repeat the many industry mistakes of the past, some of which have resulted in major accidents and incidents, costing lives, harm to the environment, billions of dollars in damages, recovery, fines, not to mention damage to company reputation. Therefore, not only do we focus on the critical technical knowledge and skills required, but we also ensure that attendees understand the equally important organizational issues and barriers that have been at the root cause of many major industrial accidents over the decades. At AIE we pride ourselves in delivering the most comprehensive, relevant and up-to-date content for each topic. Beyond the important basics we incorporate the key knowledge derived from the latest industry codes and standards, best practice literature publications, the latest technologies in inspection, materials, and monitoring, etc. and industry trends such as digital transformation and the 4th Industrial Revolution. Our trainers have experience that span more than 120 years in countries of Asia, Africa, the Middle East, Europe and the USA and are suitably qualified to answer the majority of questions you may have. Through our courses you will have the perfect opportunity to tap into their exceptional knowledge, as well as the shared experience of all the attendees through the interactive style work sessions. Finally, we aim to ensure that all attendees are active participants, all achieve their learning potential, all have fun and leave the course energized to apply their new-found knowledge when they return to work. Although we deliver training through traditional open public courses, where you can register via our website, we also prefer to offer a bespoke experience, through in-house training courses. Why is this and what are the benefits to you? Firstly, the course content can be tailored and adapted to meet your exact requirements, to reflect your types of asset and operations and to match the current knowledge level of your staff. Case histories and/or current risk/problem topics can be based upon your experience, making it more relevant and productive. Secondly, we can adapt the delivery to best suit the working schedules, rotations and location of your organization, therefore causing the least time impact and if conducted at site, representing a considerably more cost-effective solution. Thirdly, we can incorporate a testing element, should that be required for your competency management system. Whether in-house or public, our courses can typically be delivered in one day, three days or five days depending on the level of detail and objectives required. For more information about our training services, click here to view our training webpage.